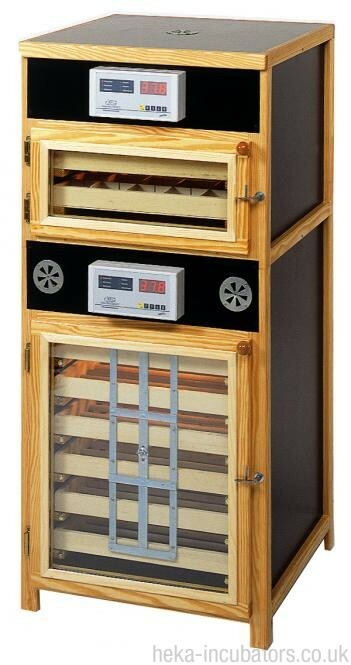 HEKA-incubators with a separate hatcher allow maximum flexibility, enabling you to vary temperature and humidity in the incubator to ensure the very best hatching conditions prior to moving the eggs into the hatcher sited above the incubator. With this model you could set around 250 chicken eggs, or 375 pheasant eggs every week, for continuous hatching. Once the eggs are moved to the hatcher you are able to create the best conditions for hatching, particularly the higher humidity that is so vital at this stage. The remaining eggs in the incubator can then still be brooded with lower humidity until they also are ready for the final 3 or 4 days of hatching and are transferred into the hatcher. We particularly recommend having this separate hatcher when brooding poultry or game birds continuously, and for waterfowl, because the high humidity is extremely important for success in hatching. Both compartments are technically completely independent machines, but they operate as one associated harmonious unit. Fully-automatic egg-turning for the incubation compartment. Fully-automatic humidification for both incubator and hatcher. Microprocessor controlled temperature regulation for both incubator and hatcher. To match the high-class cabin we install probably the most reliable control system on the market with an absolutely precise temperature regulation. This control has a failure rate of under 0,1% in the first 5 years - a value, which confirms the incomparable high quality of HEKA incubators. Temperature, humidity, turning and cooling can be programmed with just a few key presses. The incubator is completely equipped with all the accessories that are needed. Included is tan interior light, five incubating trays of your choice for the lower incubation compartment, and three uncovered hatching baskets for the upper hatcher, a detailed manual and different connectors for turning any quantity of trays in the incubation compartment.